They say write like your parents are dead. When one of them actually dies, there’s no excuse anymore. The little boxes of silence are yours to open. I tried to write a book for you when you lived, but things got in the way. My deadline, you passed. You would never have been able to read it, while you were here, but I felt it important it existed for you while you breathed, as though in some miraculous way you would know of it in your soul. One day I will finish it, but today I will write this, because it’s empty and long, and there are many of us left here remembering you. Bit by bit the place you occupied in the world is reduced, the museum of your stuff is disbanded, and one day soon the shell, which held you will be gone too. A tiny patch of the earth, minuscule co-ordinates on which you walked, rested and slept will not belong to anyone that knew of you. That place will migrate to our memories. Which version of it will we visit? Will we see you there as it is now? Transforming and transforming. How easy it is to reinvent the past? 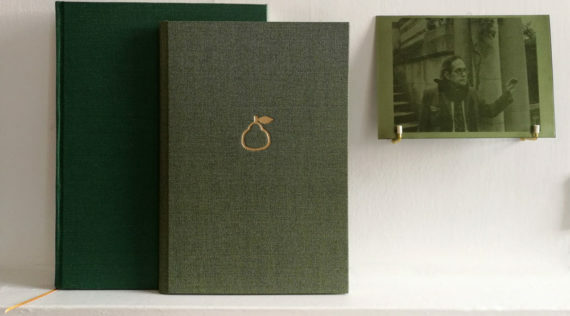 I have been very fortunate to be awarded an a-n Professional Development Bursary 2017, to learn new skills to make an edition of artist books ‘Hazel House’: a book of photographs paired with poems about grief. The photographs are of my late father’s house and childhood home. The house is a symbolic space loaded with love, memory and shame. After our father’s death at home, my brother and I worked together over the course of 6 months to transform the house into something that resembled a conventional home. Whilst working on the house I was writing the poems. The photographs were taken just as it was uninhabited and staged for viewings ahead of sale. They focus on points at which the constructed fictional home meet memory. Over this summer I have been on wonderful courses funded by this grant. 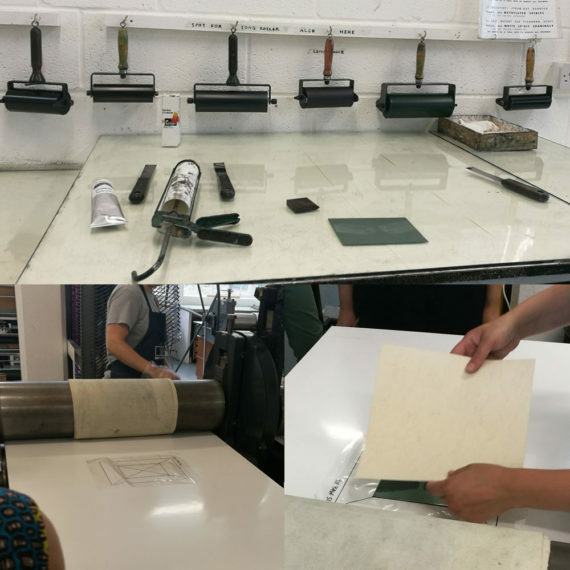 At London Centre for Book Arts (LBCA), I learnt Round-back Case Book Binding, Single Section Case Binding with Foil Embossing, and Letterpress. 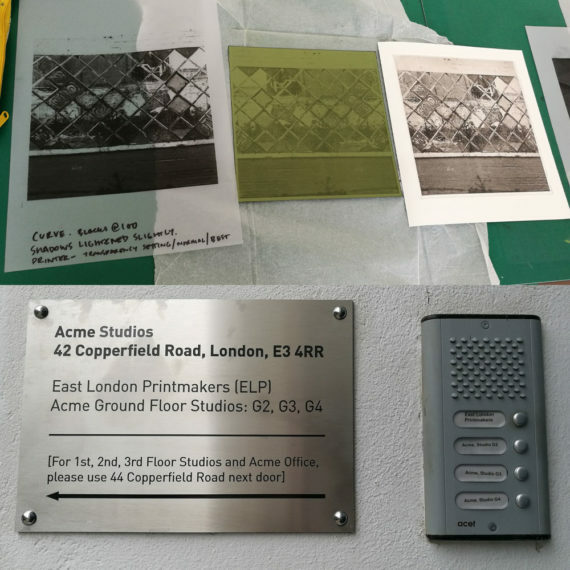 At East London Printmakers (ELP) I did a three-week Photopolymer Etching course. It has been a huge learning curve with so many new processes to remember, and so many stages along the way to mess up the finished work. My ambition for an edition of 100 books has been tamed by a respect for the complexity of binding word and image between covers. I am going to write a following 4 posts to describe the processes and refresh my memory ahead of beginning open access to the workshops to start my project. In order to have photographic images in my final book edition ‘Hazel House’ I decided I wanted to print them as photo polymer etchings. The process shares some similarities to screen-printing and etching. The course was at East London Printmakers (ELP), run over 3 weeks on Wednesdays, it was a enjoyable experience getting to know our large group and learn about everyone’s varied disciplines: photographers, an illustrator, architects, printmakers and graphic designers, we were all looking to use the process for a diverse array of projects. The plates that we used were polymer-plated steel. Intaglio – this is printing where the areas that hold ink and print are a recessed level. This type of printing holds more detail and works really well for tonal images such as fine detailed photography. You will need KM73 photopolymer plates for this process; these are available from Intaglio Printmaker (for artists based in London). Relief – this is printing where the ink is rolled and prints from the raised surface of the plate. This type of printing is good for graphic images where there is bold contrast. 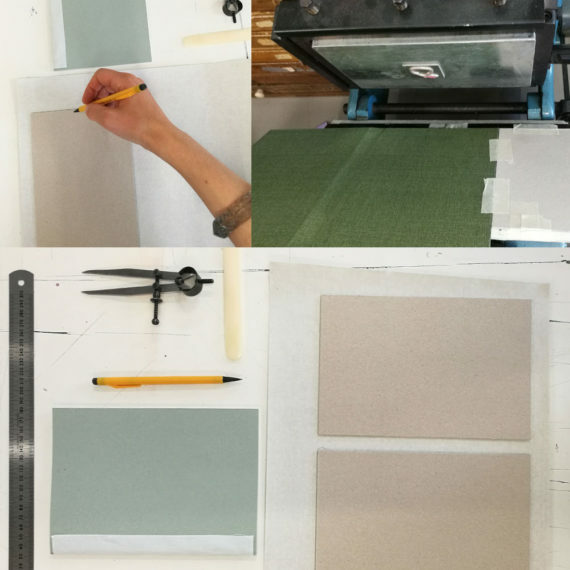 You will need KM95 photopolymer plates for this process; these are available from Intaglio Printmaker (for artists based in London). The process starts by making a positive. A positive is an image printed digitally onto a transparent film like acetate. To begin: a digital image is manipulated on Photoshop to get the required levels of contrast and tonal detail, cropped and made print ready. Always use non-destructive editing, as you may wish to use the original image for other purposes. Make adjustments to the levels in layers. 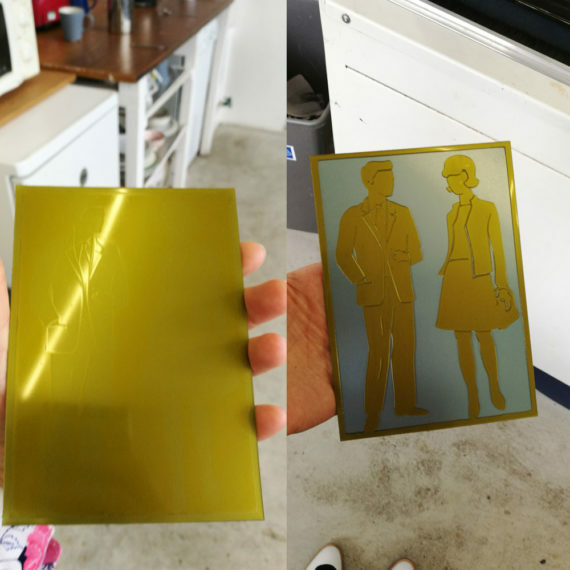 It is then printed onto Folex laser film from a printer. The drawback of using your average laser printer is that sometimes you get streaky lines through the image. Depending on the type of image you want and suitability, you may wish to get a professional positive made by image setter (you can find these online). You can also use True Grain to make a positive, which you can draw directly onto. Once you have your positive, you unwrap your polymer plate (which is light sensitive), remove the protective film and place it on top of the UV exposure machine bed. Making sure the glass is clean first. The machine at ELP takes 10mins to warm up. Place the aqua tint screen over the top of the plate (ink side face down), and close the glass lid clamps. The maximum plate size that will fit in the machine is A2, or several plates can be exposed at once. Engage the vacuum button, wait until all the air between the plate and the screen has been removed, and there are no air bubbles. Using Two hands on the handles flip the lid of the machine, so the plate can be exposed to the UV light. Set the exposure time, half power for mid-tones, if your image has high contrast, then use full power. Real time is seconds / integrator (units) – this compensates for the age of the lamp, which when new will be stronger, and overtime will be dimmer, and exposures need to be longer. At ELP we were setting the timer to 800 half power. Press ‘run’ wait for the buzzer, then press buzzer reset when it goes off, flip the lid, turn vacuum off, unclamp and open the lid. Roll up the aquatint and put away. Next place the ‘positive’ ink side down on the polymer plate (carefully maintaining boarders, and not pressing into the plate as the polymer is soft until baked / hardened by exposure to UV). Close the glass lid, clamp, vacuum, spin the lid and reset the timer to 800, then run. In the acid room fill a tray with water and mixing hot/cold get the temperature to 20/25 degrees. Once the buzzer has gone off and you have retrieved the plate/s take it to the acid room, and set a timer for 3mins. Submerge the plate in the water bath and with a new sponge carefully systematically wipe over the polymer side of the plate until the picture emerges. The areas that were covered by darker areas of the positive image have not hardened by the UV light and remain soft therefore they wash away. If the plate still feels slimy under the finger then re-wash as the polymer is still coming away. Very fine areas are quite fragile, so you have to be delicate. Blot the plate with newsprint, and quickly dry with a hairdryer. Harden the plate on the exposure machine, attach a little loop of brown tape to the underside of the plate and attach to the bed of the machine, close the lid without the need to vacuum, flip the lid and run. Alternatively you can leave the plate on a sunny windowsill for an hour or so. You can only use oil-based inks for this process, and at ELP they use vegetable oil for cleaning, as this is more environmentally friendly. At this point you may wish to trim your plate on the guillotine. Use a burnishing tool to file off the cut edge burs, and the other edges where necessary. This is important because your plate will emboss the paper you print on, and you aim for a nice square edge, and more importantly if it is a very sharp edge it will cut the blankets on the presses and these are very expensive to replace. Now for inking the plates: In advance of printing prepare your paper: cut or tear your paper to size and cut down pieces of newsprint larger than your plate / paper. When working in the inking area put gloves on and be ready to take these on/off regularly, this saves you time washing you hands which is very slow with oil-based inks, and protects the clean printing presses and your paper. On a glass-covered work surface squeeze out some ink and some extender, scraping excess off the nozzle with an ink knife. Mix together on the glass. Take a rubber squeegee and dip the tapered edge of it into the ink. Holding your plate in the palm of your hand with it half hanging off the edge of the workbench, evenly apply the ink methodically in stripes in one direction (top-bottom) then the other direction (side-side). Take a piece of scrim and make it into a fluffy ball with no creases. Holding the plate half off the bench, use circular motions to press/rub in small sections on the plate, until you have done this across the surface of the plate. Next using linear wiping motions wipe the plate. Use tissue paper to wipe the plate, keeping the tissue paper and fingers flat and parallel to the plate. Take a lint-free rag and wrap around forefinger without creases and wipe plate until the raised areas appear clean. Using whiting wipe over edges of the plate. Your plate is ready to print. In advance of inking your plate take a piece of acetate larger than you printing paper and place over the paper, using a Sharpie permanent pen, draw around the paper using a ruler. Now draw two diagonal lines from corner-to-corner of this square or rectangle, to form an ‘x’, this gives you a marker for the centre of the paper. Remove the paper from under the acetate. Now place the acetate over your plate positioning the plate in relation to the paper guides and centre. When you are happy with the position mark the corners of the plate on the acetate with dots. Remove the plate and join the dots with a ruler. Write ‘This Way Up’ in reverse. This is you printing guide when placing everything on the press. You can have multiple paper guides on the one sheet. Remember when using the guide to have the ink side face down on the press to avoid ink transfer. Because the paper needs to press into the indentations of the plate that contain the ink, you soak the paper in a water bath for 5 mins. Before putting it in the water bath mark small initials in a corner on the front or back of the paper, as it is difficult to differentiate when the paper is wet. From doing this course I learnt that I made a painting in 2013 on the wrong side of Fabriano paper, this is a common mistake, as I noticed a drawing in the Jerwood Drawing Prize was also on the wrong side of the paper. On Fabriano paper the name is embossed on the reverse of the paper, rather than the front, so on a framed print where you see a deckle edge the brand name Fabriano should be backwards if the artist has used the paper correctly, other brands such as Sommerset have their logo on the front side of the paper. 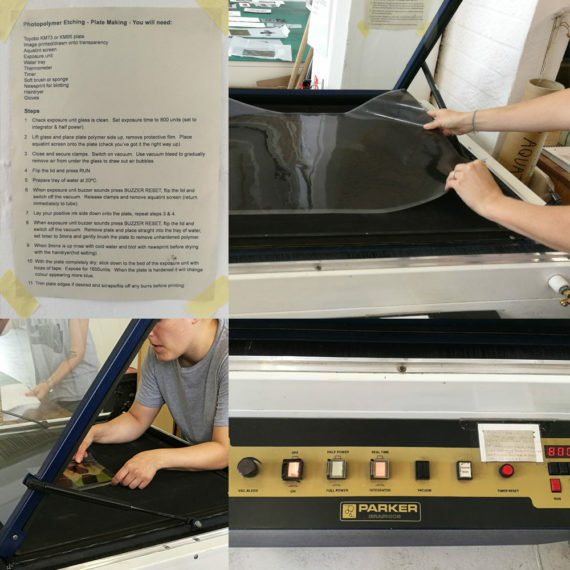 When you are ready to print and the acetate and plate are on the press, remove a piece of soaked paper and place it on a vertical perspex panel and squeegee excess water out. Place the paper between two towels and using a kitchen type roller, roll over the towels. Removing moisture from the paper is important to protect the blankets. Place the paper on top of the plate, cover with a sheet of tissue paper. The blankets should already have their end tucked into the press, and should be in this order: Thick, Med, Thin. Flop the blankets over the tissue paper and turn the large press wheel with two hands. Keep turning until the blankets are almost all the way through, but never roll them all the way. Leave the wheel handle at the bottom at the end of the cycle. Flop the blankets over, and carefully peel the paper off the plate. Dry the paper on drying boards with more tissue paper on top. The prints should be left for 1 week to dry, but can be stacked between boards. Use an ink knife to lift the plate off the acetate, and clean the acetate with a rag. Depending on the tone of the print you have made, you may want to do a secondary print without re-inking, or you may wish to re-ink the plate. This process is good for images with less detail. There is no Aquatint stage to the process. There is more to wash away of the polymer, and the exposure time is less. While you wait for the UV exposure machine to warm up, for the bulb to turn from white to purple, check the glass lid is clean a streak-free. When looking at your positive, the black part of the image will wash out, because this area will not have been exposed to light. For relief printing you use full power, rather than half power on the UV exposure machine. While your plate is exposing prepare your water bath. Once the plate is exposed, remove from the machine and place in a water bath wiping the plate with a clean sponge and a brush to work into finer areas. You don’t need to time this washing as it will vary depending on the plate, just continue washing until it doesn’t feel slimy. Dry the plate with a hairdryer. Dust the plate with a tiny sprinkle of talc and work into the surface plate if it is sticky, put a looped of brown tape on the reverse of the plate and stick to the bed of the machine and harden it with two lots of 800.The plate is a negative, so any text should be visible in reverse on it. Once hardened you may wish to trim your plate on the guillotine. When you ink your relief plate it is more like doing lino printing, so you are loading the ink onto the plate using a roller. Soak paper in a water bath for 10 mins, squeegee, blot and roll between towels. Place your acetate guide and plate on the middle of the bed of the press. Place the face of the paper onto the inked plate, cover with tissue paper, flop the blankets over, and run through the press. If your print is too light, then for the next print you can add pressure if needed via the bolts on the top of the press. You can use relief plates for blind embossing. On this course I made a Male / Female Toilet sign image from a series I am working on, and I was more satisfied with the blind embossed images over the inked images. I think I now have a secondary artist book edition to work on right after the first. Other people on the course did really beautiful images using different coloured inks, and mixing intaglio and relief printing using multiple plates. There is a lot of scope to experiment with both of these processes. On the final week I made an A5 plate and made several Intaglio prints of one of the most important images from the Hazel House series, and I was really pleased with the level of detail and tonal range of the image. I am looking forward to the open access sessions at both ELP and LCBA that this wonderful a-n Professional Development Grant has afforded me. But before any more printing or bookmaking it’s time for me to plan my layout for the ‘Hazel House’ book. So, those wooden boxes displaying matchstick toys, trinkets and wooden type hung on D’s walls were once all plan chests of alphabets, fonts and points ‘Type Cases’. On this course we got to rummage in stacks of drawers and pick our way through little pieces of lead to mirror write phrases, sentences and experiment with symbols. I did this course the day following the Single Section Case Binding at LCBA, by the end of the weekend I had learnt two new processes and my mind was a whir of ideas and information. This course was the smallest group, there were just 3 of us, and this was probably because the process was so fiddly and time consuming. We were mostly using small lead type, the type you would find in a book or on a newspaper. 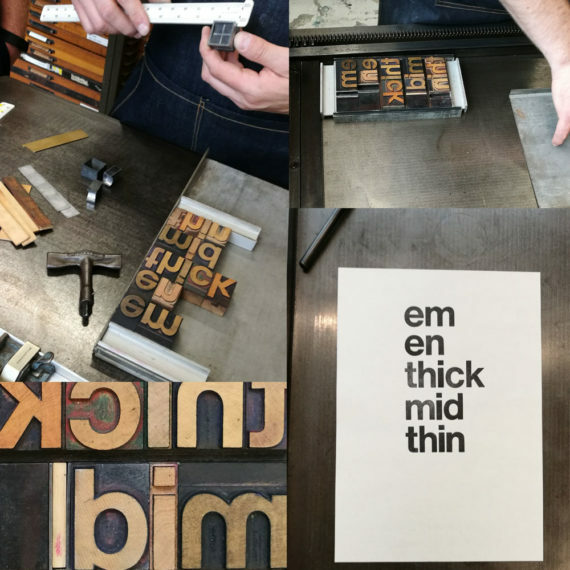 The other people in the group experimented with wooden type, and I used some old advertising picture blocks ‘Copper half tone blocks’, these are what photographs in newspapers would traditionally be printed with. I decided I wanted to make a very thin outline with decorative corners around a sentence I wrote as my main practice piece. This was a very fiddly thing to set up as you have to measure and fill all the blank space between the type and the thin brass lines, whilst supporting all the elements and adding tension. I finished the day with several prints of this, but there would not have been time to make another sentence. It was important to know how time-consuming the process was. 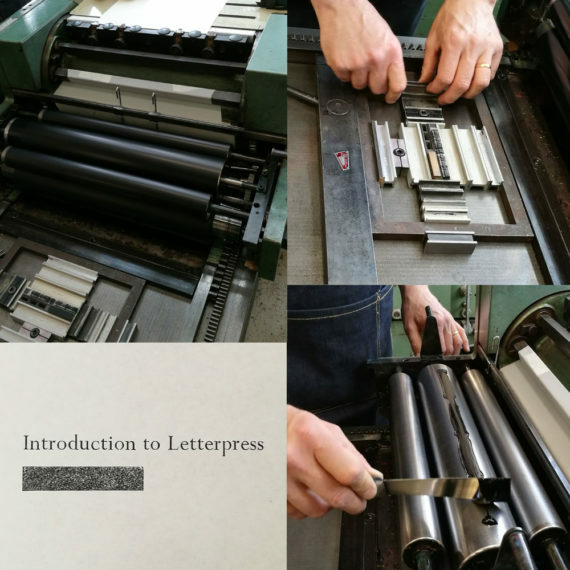 LCBA has a Proofing Press, this is incredibly useful for making fast prints to either proof, or if you are working on something you want to keep adapting, or don’t want many copies of. Imposing stones, this is a stone surface you work on to set up your type, as it has to be completely flat. In order to create white space on a page around the printed word you use ‘Furniture’, these are tiny I-beams of metal in varied lengths, these sit within a metal frame ‘chase’ and are held in place with tension from small expanding clamps ‘quoin’, and expanded using a ‘quoin key’. We used oil-based inks. There are 14 colours that can be mixed to make up all the Pantone colours. ‘Sorts’ are the individual case lead pieces. Typesetters used to get lead poisoning from smoking whilst handling type without washing their hands. When using lead type it is really important to always wash your hands before eating, and avoid touching your mouth. There are 12 points in a Pica. 6 Picas to 1 inch. We used type scale rulers to measure lengths of furniture require to fill spaces. When making a sentence you spell it out on a composing stick, and decide the width of your text. You hold the stick in your left hand if you are right handed, placing letters upside down with the nick in the side facing outward. You can print other items on the presses at LCBA such as Lino prints, but everything has to be raised to ‘type height’. Quad spacer is a square shaped bank spacer. You would use this were you have an ‘M’. For a space between words you use a ‘Mid’. 24 picas is a good starting measurement. For Wood type the measurement is called ‘Line’. When opening pots of ink, there will often be a skin on top. Peal back a tiny piece and dip pallet knife in. The press is made up of: Feed Board, Bed, Rollers, and Steel Rollers. You ink the type three times then make a proof onto newsprint. The ink is applied to the steel rollers and the press is rolled across the type to ink it. 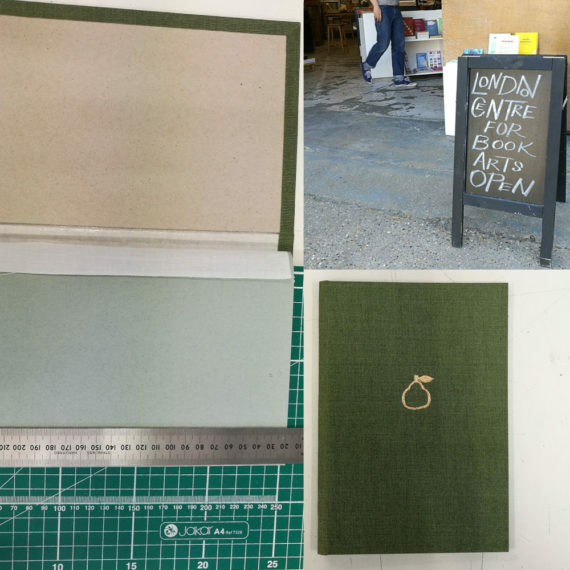 The second course I did at LCBA taught us how to make a slim hardback notebook with a single bound section of paper inside, and with a foil embossed cover. 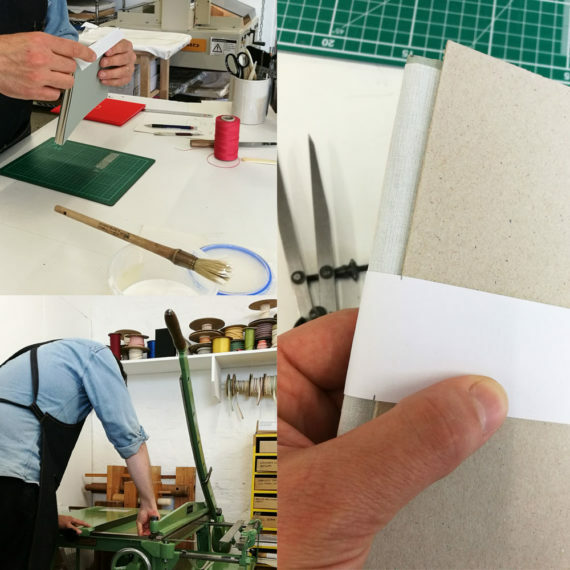 It is advised to do this course before the Round-back Case Book Binding course I did first, as it is a simpler process. 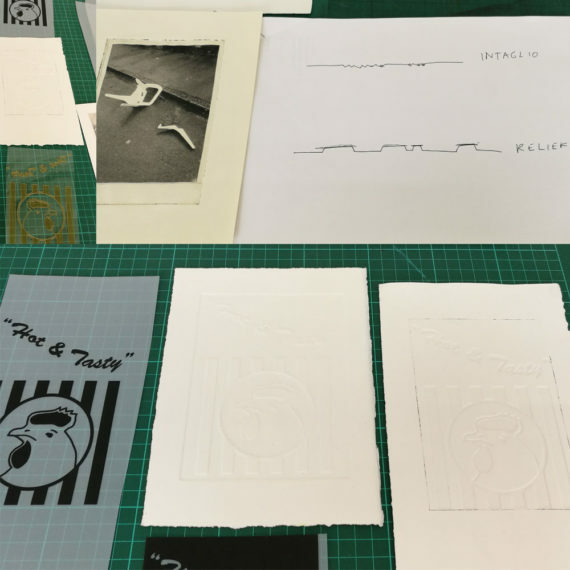 Both the bookbinding courses teach processes that you could replicate at home / in the studio with minimal heavy machinery, with only the core hand toolkit. 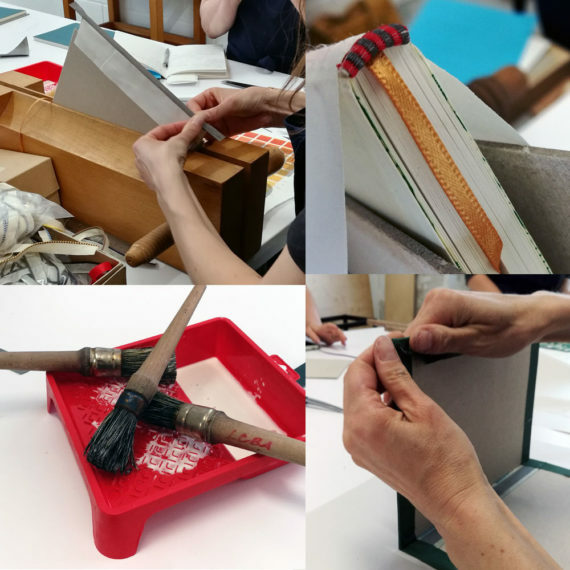 The course began with an introduction to the glossary of bookbinding terms and tools. Bookbinders tend to use methods that involve by-eye measurements, templates, and rely on tools such as spring dividers, as well as rulers. It is very practical fast work where the hands remember the process. There are parts that I found very sensible for the dyslexic brain, and parts that get a little more complicated. It’s all about being organised, process based and keeping an orderly and clean worktop. Most of the work is performed standing. This time the making was more familiar to me, and the final notebook I made had fewer mistakes and I left feeling more hopeful. I know after finishing the course that I definitely would like to make a multi-section case bound book for my edition, but not with a rounded spine. The foil embossing looks really striking, so I know I would like to have both the title and an image embossed on my cover, and possibly the spine. I am also thinking of designing and printing my own end papers. As with all my projects, this one is growing. With a new bone folder – soak it in baby oil overnight and wipe off in the morning, this helps keep the bone from cracking. An old fashioned method is to run the end on the sides of your nose to keep it oiled. At LCBA they use a Pin Vice, this tool is like an Awl, but it holds a thick needle, which you can replace, and gives you a finer piercing. Grain should always be parallel to the spine, if it’s not the book will not sit or open well over time. Because the numbered pages and orientation of layouts in bookbinding gets complicated you use an imposition, which is a dummy, numbered folded test paper. You can fold this, slice the paper, unfold it and work out your layout. A lot of people make their layout in InDesign ahead of using traditional bookbinding methods. *However remember to set up the design for page creep! Inner pages will have more trim than outer pages. We made a 10cm wide paper template slightly longer than the height of our book for piercing holds and marking the trim. For a book multiple make an ‘L’ shaped hook template in card, that you can slot onto the head of the section. In bookbinding you use linen thread to sew the pages, and you lubricate this with beeswax. We used 35/3 thread (the higher the number the thinner the thread). You can sometimes pick up nice wooden reels of this thread in charity shops and car boots sales as well as buying new. For sewing a section you need thread 2.5 x the length of the section. Start sewing in the middle of the inside of the section. Bookcloth is tissue-backed cloth. The grain runs parallel to the selvage edge of the cloth roll. Vintage bookcloth is starch filled and is different to work with and has a really beautiful finish. Bookbinders use EVA glue, which is similar in consistency to PVA, but is non plasticised Ethylene-Vinylacetate. It is thinner, archival and reversible, so it allows for future book restoration. When cutting paper with a scalpel, top tip is to stand on one leg to add more pressure. You should cut from top to bottom in a singular smooth motion, and start again and repeat until you have cut cleanly through all the paper when trimming a section after sewing. When cutting, put a piece of scrap paper under the section to protect the paper. ‘The Square’ is the ‘L’ corner of cover visible behind the section. People really respect a good square on a hardback book. We worked with a 3mm square. After making a few books you’ll be very good at eyeballing a good square when making. For the spine structure we used fray-knot Calico. You fold a strip in half and pitch it onto the glued edge of the spine, then rub down with the bone folder. Boards are normally cut long grain. We cut out greyboards on a large green hand guiliteen at LCBA, but you could cut 2mm greyboard with a very steady hand with a Stanley knife if working at home / studio. Always glue the thinner of two materials! For example: the bookcloth, not greyboard. ‘Turn-in’ is the gap of bookcloth you fold over for the spine. 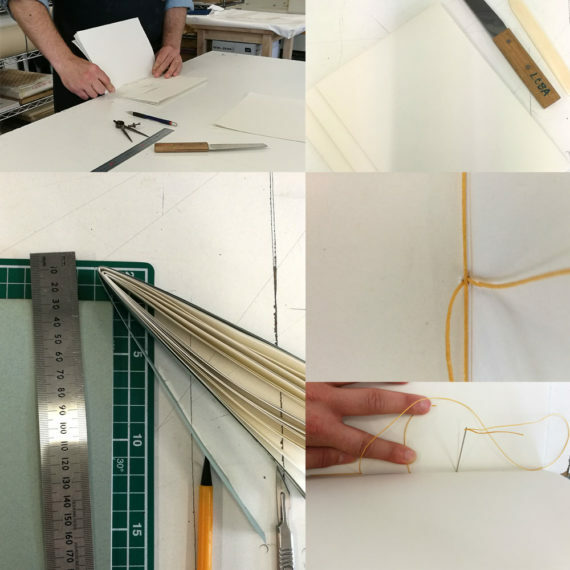 Ever since I was an art student, and a lecturer introduced us to the concept of artist books and gave us examples to pore over, I have stockpiled ideas for artist books I would like to make, but as an adult have never done a course in bookbinding. As artists you spend all your money on tools / materials, and time making work. It is difficult to take pause to learn new skills to make entirely new things. I am incredibly grateful to a-n for the amazing opportunity of the Professional Development Bursary to learn so many skills. As a child I was lucky to have as my atheist godmother D (Diana Hardy Wilson, a Calligrapher) at the opposite end of my road. I used to love spending time with her in her flat looking at her collections of wooden type, plan chests, book presses, inks, and papers. One day she taught me to make a little red book. It was A6, single case bound in bookcloth, with cream coloured cartridge paper with an Indian metallic ribbon page marker with red and green threads. Although at the time I did not know what these things were called, I have a strong memory of making this book, and D once gave me a bone folder for Christmas, which I still have. 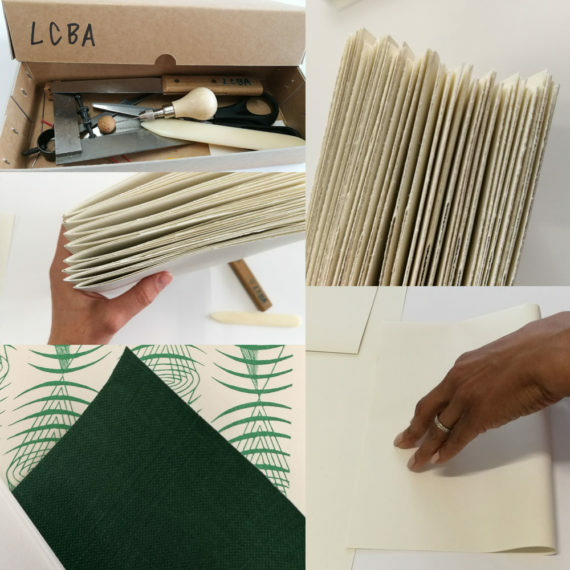 As an adult, to step into The London Centre for Book Arts (LCBA) was such an exciting experience, to see a beautifully equipped workshop entirely dedicated to people inside lovingly crafting books on such a sunny day. 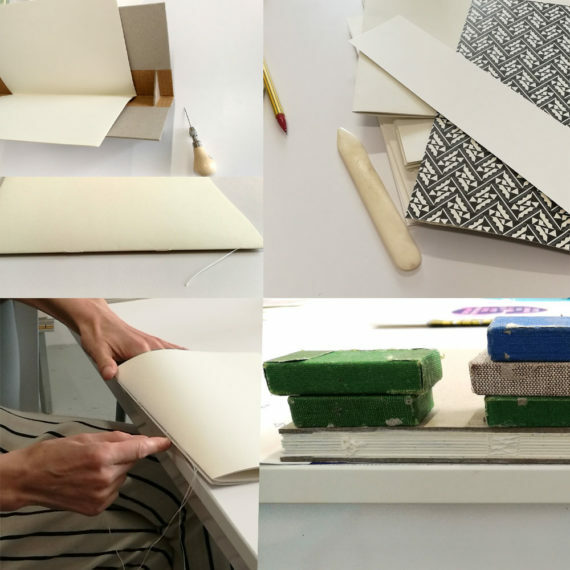 The first course I took was the hardest; due to summer commitments I did the Round-back Case Book Binding course before a beginner’s introductory course, or intermediate Single Section Case Binding course. It was a large group of us each learning the skill to pursue different purposes. A group of three women from a specialist stationary company were there on staff training, and would later be marked on their books by their boss. Everything went relatively well until I made my first mistake sewing through the wrong hole in one of sections causing things to go a little lopsided. I had to start again, and quickly became behind the group. 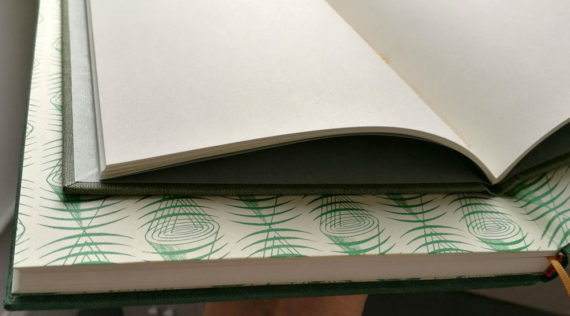 At the beginning of the course I decided I wanted to make a beautiful notebook, so when we got to the stage of selecting our end papers I greedily bought a vintage Edward Bawden design which is dead stock, and should probably only be used by the very skilled, and picked a green book cloth to match. The dimensions of my end paper were different to the groups, so this dictated the dimensions of everyone else’s books…I was becoming a bit a of a problem pupil. As this was a round-back case binding, we had to take the stitched and glued spine once dried and holding the book bash it with a fluted hammer to form the curvature of the spine, and the horseshoe of paper’s open edge. I struggled with this and the teacher had to finish this for me. When it came to making the cover, I folded the bookcloth in a very peculiar way around the corners of the greyboard, causing more problems that had to be remedied. Casing-in (gluing and manoeuvring the bound pages into the cover) is when things went from bad to worse, everything became skewed and the spine was not aligning with the cover. As everyone finished their books I had to be rescued at the end by the teacher who looked at it and agreed it was hopeless. We surgically cut the end paper, and badly patched in some scrap we had, and mis-match Edward Bawden’s beautiful pattern. I felt very ashamed, and left the course humbled by my lack of experience. Well, at least I made all my mistakes on the first course; I reckon it’s like the first pancake, a sacrifice to the gods. To the untrained eye I made a passable notebook. To test the grain direction – cut a small square of the paper and test the way it naturally bends when lightly pushed against in the palms of your hands. You can also wet a small piece and see which way it bends, or tear it, and it should tear easily along the grain. 16 pages for a Section is a good average. If paper is thicker you could reduce this to 8 pages. If you fold a piece of paper in half, you have created 4 pages.